The Wales Audit Office are now carrying out a 'review' (investigation) of the council's role in all this. The Llanelli Herald reports that Swansea University are no longer working on the Wellness Village. With Sterling now ditched, the contract (see pic below) signed between the council, Sterling and the University is now dissolved. Hywel Dda health board has also confirmed, again, that they have made no financial commitment to the scheme. Mark James' 'key partners' are dropping like flies... As I said in April, a scandal in the making. Sterling Health have now been ditched. Wales Online has a report here. The council wouldn't say how much it has spent on the Wellbeing Village to date. Its chief executive Mark James, added: “The council and its partners remain fully committed to develop the Life Science and Wellbeing Village. "The council will now finalise the business plan to develop the Village with key partners including the Hywel Dda Health Board and the two universities [Swansea and Trinity St David]". What an utter mess. These statements (issued at 5.03pm on a Friday, of course) beggar belief. 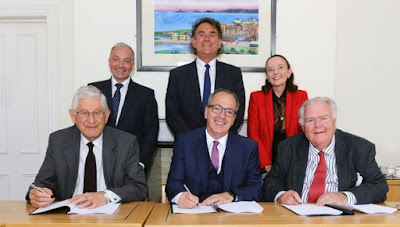 Sterling's website, the council, and numerous press releases all confirm the 'landmark deal' had been signed and sealed. The council even 'partnered' with them in their previous incarnation as Kent Neurosciences. As I said, the council have already wasted millions on the project. A FOI back in August 2017 put the figure at over £2m between the Welsh Government and the council, 18 months of further expenditure has passed since then, and as we know, the project required £127m of private sector funding. The two health boards have no money to invest, and have in fact refused to fund it, and Swansea Uni and Trinity St David's (of which Mark James happens to be a director) are equally shaky. Let alone the matter of the current suspensions. Financial institutions won't touch this with a bargepole. Sterling's appointment was a corker to say the least; a company with a £137k deficit and zero income, and, as I have pointed out before, the family members were all set to cash in with their own little enterprises in this project, James Dickmann with Medparc and Phyllis Holt-Dickmann with the private creche. (for more, please see below or search this blog). The responsibility for Sterling's appointment (the one bidder) was, as I said below, ultimately down to Mark James. Everything that has happened, with Meryl, Clement, Sterling etc has been with his full knowledge and on his instruction. And his sidekick Emlyn Dole? Mark James has led him like a lamb to the slaughter. What an idiot. I could see there was something seriously wrong with all this over two years ago, it was a con and millions have already been siphoned off, and I've written and warned about it ever since. I'm just a blogger, so why on earth has it gone this far? The two governments must start the 'rapid investigation' without delay, and in fact, what really needs to happen now, before the shredders get going, is a criminal investigation, starting in Mark James' office at County Hall, Carmarthen. If he gets away with this one, after everything else, there's no bloody hope. Update 6th December; The UK and Welsh Governments have announced a 'rapid independent review' of the City Deal, covering 'due diligence and governance'. About time too. 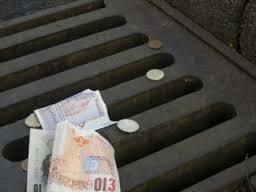 The UK and Welsh Governments were expected to announce the release of City Deal cash in early December. It seems like they've had second thoughts. Good. 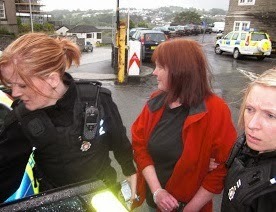 BBC report here and The Carmarthenshire Herald report here. Last Monday, the 26th November, I was the first to suggest there was a connection between the four suspensions at Swansea University and the proposed private health care 'Wellness Village' at Delta Lakes, Llanelli. It now seems I was was right. Although, aside from the Daily Mail article the details are still not clear. Following the Executive Board meeting on Monday (3rd December) where the Wellness village business case was up for approval, in private session, the council published a press release late yesterday afternoon. They have approved it 'in principle' but, given the 'events' in Swansea, put in on hold. In fact they've had a couple of days to spin the blame entirely on those 'events in Swansea'. This might have been the catalyst, and the allegations are clearly serious, but not the whole story. Buried within the council spin, there are a few key points. The project has been put on hold, indefinitely it seems, whilst 'reassurances' are sought that due legal process has been followed and public funds properly protected. This suggests, of course, that both of these elements have already been gravely compromised. Council officers have also been asked to look for 'alternative' sources of funding, if this refers to both public and private funding it suggests that the City Deal money is now unlikely, as is anything from Swansea Uni, and that the appointment of Sterling as the 'private' sector partners could well be reversed. Presumably the 'alternative' would be to rummage down the back of a sofa. According to the press release, an independent assessment will be undertaken to iron out all these nasty little creases. I would suggest that the whole project is dead in the water, or in this case, the swamp. Llanelli will now be lucky if it even gets the new leisure centre. Recent posts on this blog have detailed the tangled web of companies, directors, boards, ex-councillors, chief officer, missing tenders and potential conflicts of interest but at the heart of all this are the three main drivers, Mark James, Marc Clement and Meryl Gravell. They go back a long way. Meryl was heavily involved with Clement with the failed Technium projects and more recently with the ARCH project. ARCH, 'A Regional Collaboration for Health', was a partner organisation for the Wellness Village, heavily influenced by the American based Global Wellness Institute, but were refused Welsh Government funding early in 2017. ARCH is still significant although the project delivery team is now managed and hosted by the council. Meryl then appeared as a director of Sterling only to suddenly resign from one of the companies in November. As we know, Marc Clement was a director of Kent Neurosciences, which then became Sterling. He resigned from another company, Vardiola Ltd on the weekend of his suspension. Then we have Mark James. Meryl Gravell was, always has been, and still is, directly under his instruction, rather like poor Emlyn. The relationship between Clement and Mark James, (the latter now the lead chief executive and the accountable officer for the whole city deal), is also close, both have been the key players from the start in this whole, decidedly un-transparent saga. The strange tender process and appointment of Sterling was also down to Mark James, and Clement. Millions have already been spent on this project without a brick being laid, not even an exciting Wellness brick. The BBC reports that the Labour leader of the opposition, Cllr Rob James has called for the Wales Audit Office to step in and investigate, "Considering the strong working relationship between officers at Carmarthenshire council and those in Swansea University, I will be writing to the Wales Audit Office to ask for their participation in investigating the paper trail for the last few years". Cllr James has also submitted more questions for next week's full council meeting. The suspensions at Swansea are only the start. 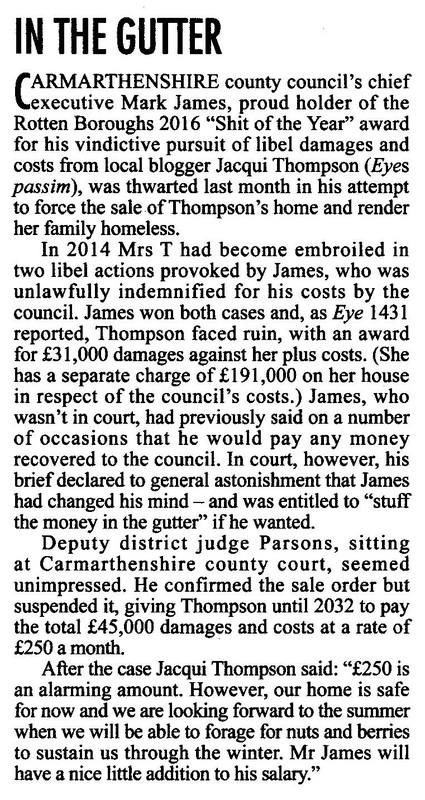 Mark James, when not making his regular appearances in Private Eye, has a track record of failed vanity projects; a rap sheet of dipping his hand into the public purse, not protecting it, he has misled and lied to his employers and the courts, and failed to declare business and financial interests. He, and Meryl, are in it up to their necks, but Meryl can be quietly put out to grass. And Emlyn? He has been negligent and weak to say the least. I am sure more revelations will emerge, including the 'events in Swansea', but I look forward to the immediate suspension of Mr James and an urgent independent investigation into his role in the Wellness scam. If anything is to be saved from this sorry mess, his removal is crucial. Please search this blog for further background and comment. This could be the gift that keeps on giving, neither Davies or Clement are very bright, despite their dubious titles. James gets to announce a review as if this puts him on the moral high ground, the investigator not the investigated. Let's hope that given the national review now announced this blatant ruse has failed. Anything done by the two would have been endorsed and known by James, the issue is did he keep his fingerprints off it. Conflicts of interest,dubious financial interests ,self engrandisement ,situation normal. Thank God for fearless bloggers and principled journalists, without whom all this would still be secret. Carmarthenshire should be proud of them. No prizes for guessing what will be at the top of list for the due diligence and governance review – the lockout agreement with Kent Neuroscience, agreed by CCC’s executive board in May 2016 and the subsequent appointment of Sterling Health (the same company in all but name) after “a full competitive tender process” which was so full and competitive that only one firm to make a bid was Sterling Health. 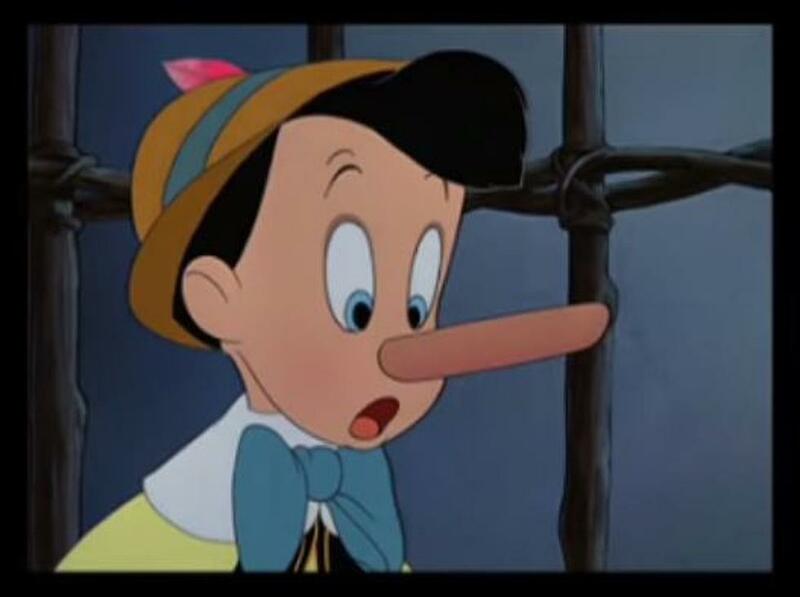 Sterling deal dropped an excuse for no need for an inquiry? Siemens, Fujitsu, and Pfizer: are they still partners in the Wellness Village? I do wonder if they knew they were in the first place. As I've said many times, with so much clear evidence of criminal conduct (misconduct in public office ) by Mark James and others, and now Cll Dole, presented to the establishment, the mere fact that no politician nor minister intervenes is a clear indicator that Wales actually prefers the way it is here - corrupt! What other reason is there? Sicily without the sun. Forged documents by Emlyn Dole, in any other walk of life, would have been a sackable offence, probably a criminal one as well. How on earth is he still Leading? A planning lawyer once told me that the further away you get from London the more it is like the Wild West and the worst place for corruption was Wales. It seems to go top to bottom and bottom to top! Does anyone trust anything less than a TRULY independent inquiry? Oh, those shredding machines and wood-burning stoves must be HOT! Time for many, many FoIs BUT be VERY sure to also include the phrase "and also under Environmental Information Regulations 2004 (SI 2004 No. 3391) " as it is relevant to England and Wales and the amount of information a council has to give under this Staturory Instrument is MUCH, MUCH greater than just FoI. @redhead....tis very true what the lawyer told you, I've also had this said to me by legal beagles. So it's not too difficult to understand why Mark James and many others are so blatantly dishonest when they know that those who have the power to step in, and should - wont! Why change a system that puts you above the law if ever you choose to get your own hands dirty? I have worked in five County Councils and in each one the County Secretary was a model of probity highly respected by Members and Officers alike .In those days it was clear that the duty of Officers was to carry out the policies and instructions of their Council. Unfortunately the advent of the Chief Executive and new laws seem to have spawned a different type of leader. Perhaps it would be preferable to revert to the old system . So now Dole is saying it was only an agreement to develop an agreement - as you say, “utter b******s”. He fails to realise that Carmarthenshire tax payers are not naive as gullible as CCC councillors. For those who don’t happen to live on his fantasy island only need look at the University Health Board Collaborative Update Report from June 2017. (http://www.wales.nhs.uk/sitesplus/documents/862/Item19iLlanelliWellnessVillage.pdf). It states that legal advice recommended the lockout agreement with Kent Neuroscience be ended and “that Carmarthenshire County Council undertake a full competitive tender process to identify a private sector partner to work alongside the County Council to deliver the full scope of the Village” and that “A decision has been taken to go to the market to identify a Joint Venture Partner to work with Carmarthenshire County Council to deliver the Village”. The Prior information notice attached to the end of the report describes the contract for this private sector partner and CCC. It states “The Authority wishes to find a partner or partners with whom it will undertake the delivery of the Llanelli Wellness and Life Science Project” and “The project could be structured as a partnering development arrangement or through a joint venture. 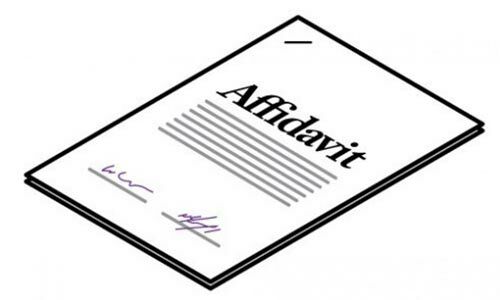 If a joint venture structure is adopted this could take the form of a contractual joint venture arrangement or involve the creation of a joint venture vehicle. The stakeholders for this project, and therefore the parties to any joint venture arrangement would comprise the Authority and its partner/s, and the delivery of the project would be undertaken pursuant to the joint venture arrangement”. This sounds like a huge publicly funded vanity project gone horribly wrong. Before more public money is thrown away, perhaps an external audit might be prudent. In my opinion, it's not just a vanity project, not even a vanity project ... follow the money. Mrs Dickman seems to have resigned as a director from the company? Yes, an external audit to catalogue this disaster would be very prudent, to say the least. As for the subject of contracts, we know that KNS transformed into Sterling and went through a 'robust tendering exercise' ...Mark James style. The Sell2Wales website make it quite clear that this was a binding contract, valued at £250m, along with Swansea Uni. The information on Sell2Wales, before the contract was awarded, shows that the council had already decided that Vinci Construction, based in Hertfordshire, would be building a major part of the development. There had been no tender for this and naming a company in this way was highly irregular. Incidentally, this week's Carmarthenshire Herald names the other two Swansea University employees who are under investigation alongside Prof Clement and the Vice Chancellor. One is named by the paper as Bjorn Rodde, a lecturer from Carmarthenshire who was appointed to the project management team for the Wellness Village in 2016. Other team members include Steffan Jenkins, the council's strategic regeneration manager and Dr Sharon Burford. The office is based at Delta Lakes and run by the council. The Herald names the second University employee as Mr Steven Poole, a senior lecturer in the school of management who, until mid-October was also a director of a Ms Ruth Clement's hotel businesses. The SBCD Joint Committee meets on Friday (14th) and the agenda includes updates on the suspensions at Swansea University, and the independent 'review' (investigation) launched by the UK and Welsh Governments. The two governments seek assurance that "all elements of the Deal will deliver the full economic benefits promised" and, "In light of recent media reports, both Governments will also require that the review covers due diligence and governance in relation to all elements of the Deal and its implementation." Without doubt Mark James is in it up to his neck. He should be suspended immediately and investigated by the police. Llanelli Herald "The Delta Lakes scheme is due to be raised at tomorrow’s (Wednesday) meeting of Carmarthenshire County Council at which answers will be sought regarding the project’s future." Good luck with getting any answers on that tomorrow! Surely Professor Marc Clement would never abuse his university position to gain any financial advantage from the public purse for any companies he is associated with? MAYBE IT'S TIME THAT COUNCILLORS WERE ALSO QUESTIONED AS TO WHY THEY CONTINUE TIME AND AGAIN IGNORING CLEAR EVIDENCE OF GROSS MISCONDUCT IN PUBLIC OFFICE WHEN PRESENTED WITH IT! DO THEY UNDERSTAND THAT TO TURN A BLIND EYE TO A CRIMINAL OFFENCE IS CONDONING THAT ACT, MAKING THEM COMPLICIT. APPALLING CONDUCT ALL ROUND. We know that Cllr Dole appoints the Executive Board - is this why they say nothing? 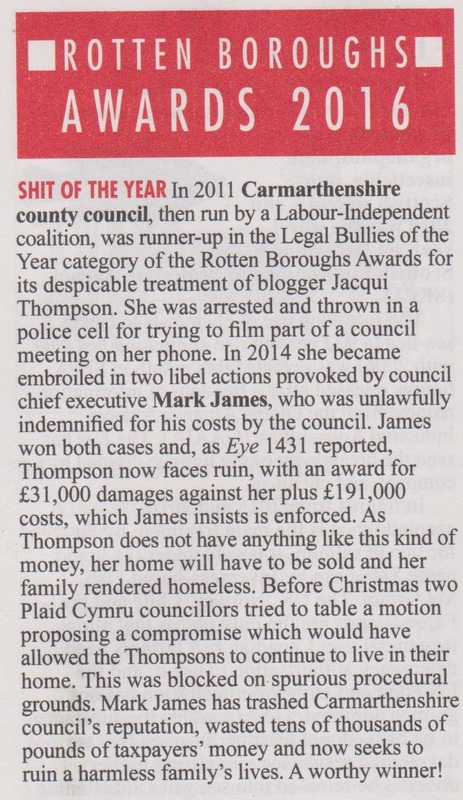 What other favours are bestowed upon councillors to keep them silent. Merry Christmas mark james, or should that read Scrooge? Chickens and eggs spring to mind. Here's to a lot of sleepless nights followed by even more at Her Majesties pleasure. You couldn't have wished this on a more deserving self-serving low life person as james. And to think he could have walked away a couple of years ago with his head held high, well, 5ft high. But no, this is what narcissism brings and how I am looking forward to watching this unravel. As someone earlier said - time for the popcorn. Although Mr.James appears to be the leader in this fiasco I think that the Councillors and in particular Emlyn Dole have a lot to answer for allowing it to get this far. 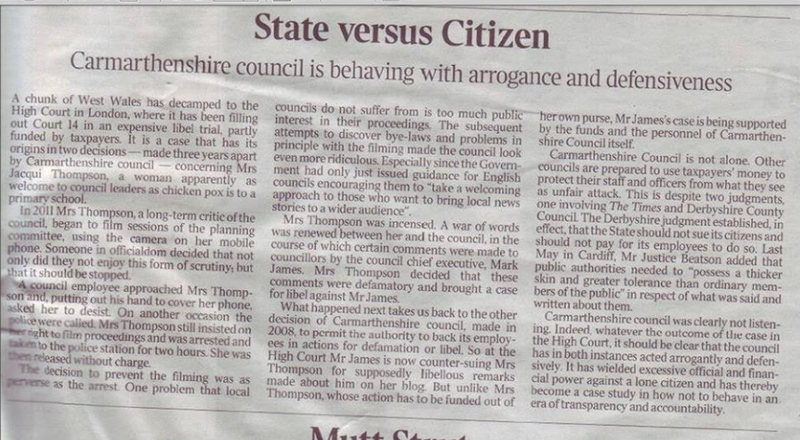 The Carmarthenshire Councillors are behaving dishonestly just like puppets and obeying the strings - why is this ?. Is there some hidden benefit ? They also need close scrutiny, they are certainly not helping the general public. Its a lovely photo. Is Emlyn the only one currently still with secure employment?